This week, not only did Apple release the bug fix update of iOS 8.1.2 download to consumers, but also rolled out the second beta of iOS 8.2. Both included a number of performance tweaks and other everyday improvements, but given that the public release of iOS 8.2 is set to early next year for iPhone, iPad and iPod touch users far and wide, it’s perhaps the most important of these two new releases. If you’re a user of the antiquated iPhone 4s and have found iOS 8 to be rather slow and sluggish in general, the good news is that, from what can be gleaned from the beta, iOS 8.2 should offer some marked speed improvements over iOS 8.1.2 by the time it’s deemed ready for general consumption. YouTuber kabriolett has carried out a side-by-side comparison of iPhone 4s running on iOS 8.1.2 and iOS 8.2 beta 2 and found that the latter is slightly quicker than the former. Sure, we’re not talking giant leaps here, but when you’re using a three-year-old device packed with an Apple A5 processor, any marginal improvement is always welcome. iOS 8 will almost certainly be the iPhone 4s’s last major update, but with reports suggesting that Apple will be running the version numbers right up to to iOS 8.3 and possibly beyond for this generation, it’s good to see that the Cupertino giant is still catering to older devices. 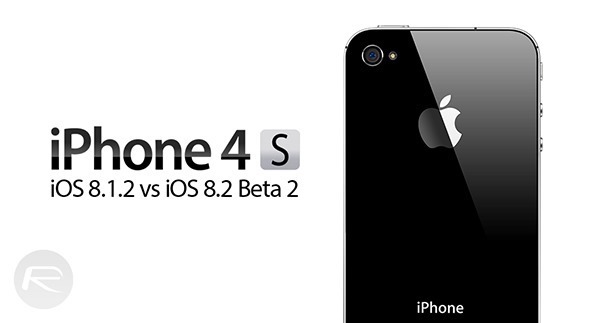 While Apple continues to improve and add features to the iOS 8 experience of those rocking newer iDevices, iOS 8.2 should give iPhone 4s users a perceivable jump in speed, and given that we’re only at the second beta, there could be scope for even more optimization in the run-up to the public release. The iPhone 6 and iPhone 6 Plus have been the key pawns in a highly successful and enterprising year for Apple, but the likes of the iPhone 4s, with its decent camera and Retina display, is thankfully still getting the attention that it deserves. The video below, compiled by aforementioned YouTube uploader kabriolett, gives you a rough idea of the kind of improvement to expect. Not, perhaps, anything to write home about, but by the same token, the still-sizeable population of iPhone 4s users will no doubt be appreciative of the changes. DONT UPDATE IPHONE 4S TO IOS 8. REDMOND PUE ARE TRICKING YOU TO DO THIS. YOU WILL HAVE FOREVER A SLOW IPHONE 4S IF YOU UPGRADE TO IOS 8. THIS IS TRUTH, MILLIONS OF IPHONE 4S USERS ARE SAYING THIS. ACHJANK. Storage has nothing to do with speed of the device. They both do have the same amount RAM. He is right, bigger flash storage is faster..